The next phase of Zoe’s wedding dress was to take the basic block and trace it as pattern pieces, add seam allowance, cut it in calico and sew it into a toile. Calico is used because of its firmness and lack of stretch. It’s very unforgiving, so if it looks right in calico, you know it will look right in the final fabric. Calico needs to be pre-shrunk – either wash it on a hot cycle or steam iron it before cutting pattern pieces. It’s always a bit nerve racking doing a first fitting: Did I write down the measurements right? Did I do the maths right? Did I draft the block right? Did I trace the pattern properly? Thank goodness the answer to all these questions was yes. The toile was a good fit, but as this is for a wedding dress we’re talking about tolerances of a few millimetres and further refining was needed to make it the exact shape of Zoe. Is it too big/small at the bust? The overall width should be adjusted. Is the waist too big small? The size of the bottom darts should be adjusted. Does the toile fit the shame of the bust? The shape of the darts should be changed (the dart lines will become angled). Do the side seams slant? They should be re-drawn, pivoting from the underarm. Is there bunching above the waist? The waist should be raised at back, front and/or sides. Is there bagginess below the shoulder? The top darts may need adjusting. Do the shoulder seams slant? They should be moved. Is there a gap between the toile and the shoulder at armhole? The slope of the shoulder should be adjusted. Most changes will also require the armholes to be re-drawn and even small adjustments can significantly alter the master, so a new a new master should be drafted, accounting for each alteration. 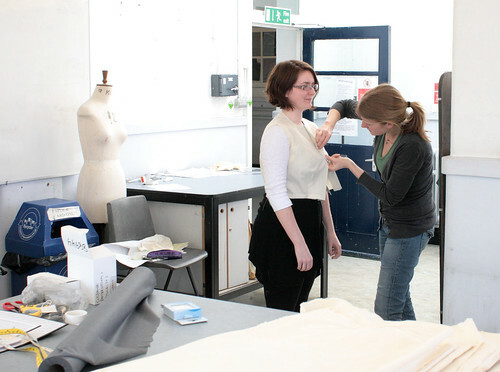 The toile fitting was a good time to for us to make decisions about the position of the straps, the height of the garment front and back and the point at which the skirt should flare. Calico is a great material for scribbling on and it’s good to mark all the adjustments on the toile as well as listing them on paper. In addition to the adjustments from the fitting, I made a few other changes to the basic block with the final garment in mind. I’m intending to cut the bodice and skirt in continuous panels, so moving the skirt darts to line up with the bodice waist was essential. I got rid of one set of darts on the skirt back because would not have worked with this panel construction, and spread the excess between the remaining darts and the side seams. 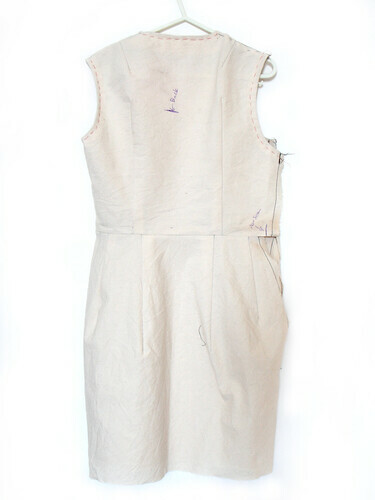 I also tightened the fit above the bust by enlarging the darts – this is to help the dress stay in place given that it will not have large straps. It’s worth mentioning that a toile would normally have a front opening. I chose to make mine side-opening because a) that’s what I’m planning for the final dress, and b) it was less sewing. I’ve just stumbled upon your blog as I’m looking for an answer to my question….I’ve made up a few basic blocks using a couple of different methods that I’ve either been taught or are from the patternmaking books available. I’m just curious to know though, what is the basic bodice supposed to fit like? Mine has about an inch gap/ease under the armhole on the side seam, but tapers in down the side seam with a little bit of ease. Do you think it’s supposed to be like that? I don’t want to make anything from it, until I’ve got it perfect. Did they teach you that? An inch of ease is probably too much. It should fit your body as closely a very fitted, tailored dress. If it’s too big at the armholes, it sounds like the bust measurement is off, but the waist about right. Thank you! I was a bit nervous altering what I had pattern made, but now it’s awesome – have just taken in the side seam on the back as the front lined up fine. Thanks for replying so quick and I love your blog! Great! It’s a whole new world of well-fitting clothes, isn’t it! Hi Sarah, I have to say that I’m not an expert but I don’t think it is necessary to line a toile. The arm holes of a toile would be faced, mainly to stop them stretching during fitting. Are you making a toile or a calico version of the waistcoat? Hi all – I have always had problems making clothes that fit and gave up making clothes for myself until I discovered the Palmer/Pletsch system for making commercial patterns really fit! – unfortunately there are only 2 teachers of this system in the UK – and although I had to travel quite a way to get to her my teacher, Mandy, was so good that I am going back to have her teach me how to fit trousers – and my mum’s coming too!